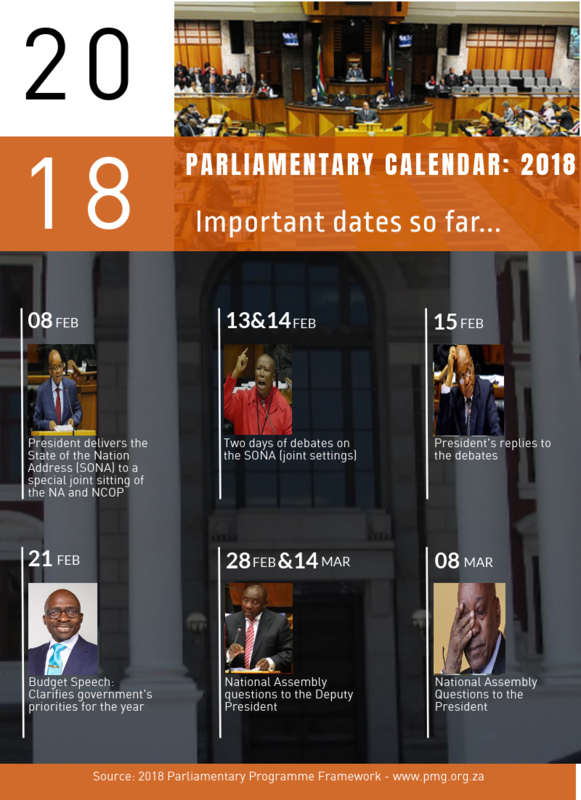 The first term of Parliament (23 January to 29 March 2018) will see the first major event of the year, the State of the Nation Address (SONA) delivered by President Zuma on 11 February 2018. President Zuma will deliver the speech, who many speculate may be for the final time, to a special joint sitting of the National Assembly and the National Council of Provinces (NCOP). The debates on the SONA will be held on 13 and 14 February 2018 and the President will reply to the debate on 15 February 2018. On 21 February the Minister of Finance, Malusi Gigaba will deliver the 2018 Budget Speech. This year, in addition to the focus on South Africa’s growth forecast and inflation rate, the Minister will probably focus on much publicised issues such as education, the unemployment rate and how to plug the budget shortfall. Other highlights on the parliamentary programme include the oral questions sessions with the President and the Deputy President in February and March, as well as the report back session of the Taking Parliament to the People: Eastern Cape initiative from 12-16 March 2018.